Oracle ERP Cloud is an innovative, end-to-end business management solution for organizations of all sizes. It’s a comprehensive cloud-based software that includes modern best practices and built-in industry standards to help businesses streamline enterprise business processes. The platform is designed with simplicity and scalability in mind to automate core business areas which include planning & procurement, financials, reporting, project planning, compliance & governance, product lifecycle, risk management, and more. It is a fully integrated Enterprise Resource Planning (ERP) that provides a suite of reliable applications designed to lower costs, improve controls, and increase productivity. Oracle ERP Cloud leverages a modern, connected approach with the flexibility and ease of cloud technology to form the backbone of multiple organizations in IT, financial services, marketing, consulting and professional services, telecommunication, sales, pharmaceutical, and engineering fields. Oracle ERP Cloud is a powerful Enterprise Resource Planning (ERP) suite designed to streamline enterprise business processes. It’s a robust platform that delivers the security, functionality, analytics, and integration tools required to run a business successfully. The solution supports multiple ledgers, entities, currencies, and accounting standards thereby allowing you to spread your wings to new markets with ease. 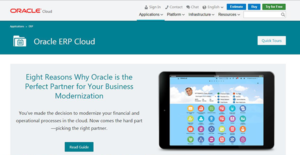 One of its noticeable modules is the Oracle Financials Cloud. This is an all-inclusive, scalable, and integrated financial management system that offers a cutting-edge reporting solution built on an analytic data model. The module generates timely, accurate, and consistent data to support the external reporting and management. It offers far-reaching support for global organizations in a wide variety of industries. Another likable module is the Oracle project financials management cloud. This is an enterprise-grade system for project-centric organizations that keeps you informed and in control with comprehensive project financial management. The project management cloud offers reliable project execution tools and procedures that can be deployed with the existing solutions or the Oracle Cloud suite. Additionally, Oracle ERP Cloud comes with a Procurement Cloud module. The procurement module features a self-service portal designed for fast and flexible contract billing and a supplier portal that makes it easy to collaborate with suppliers to select the best, enforce policies, and manage supplier risk. It streamlines the source-to-pay process via social collaboration and automation while minimizing costs to achieve higher margins. Better still, there is a Risk Management Cloud designed to streamline and manage financial compliance. The module features a secure, centralized risks control repository aimed at decreasing financial reporting risk. Every enterprise has different needs and needs a software that can be personalized for their size, kind of employees and customers, and the particular industry they are in. For these reasons, no system can proffer perfect tools off-the-shelf. When you try to find a software system, first be sure what you want it for. Read some Oracle ERP Cloud reviews and ask yourself do you need basic tools or do you want sophisticated features? Are there any industry-specific functionalities that you are searching for? Get the answers to these questions to help your search. There are multiple elements that you need to reflect on and these include your finances, particular business needs, your company size, integration needs etc. Take your time, use a few free trials, and finally zero in on the system that presents all that you require to enhance your organization efficiency and productivity. How Much Does Oracle ERP Cloud Cost? We realize that when you make a decision to buy ERP Software it’s important not only to see how experts evaluate it in their reviews, but also to find out if the real people and companies that buy it are actually satisfied with the product. That’s why we’ve created our behavior-based Customer Satisfaction Algorithm™ that gathers customer reviews, comments and Oracle ERP Cloud reviews across a wide range of social media sites. The data is then presented in an easy to digest form showing how many people had positive and negative experience with Oracle ERP Cloud. With that information at hand you should be equipped to make an informed buying decision that you won’t regret. What are Oracle ERP Cloud pricing details? What integrations are available for Oracle ERP Cloud? If you need more information about Oracle ERP Cloud or you simply have a question let us know what you need and we’ll forward your request directly to the vendor.